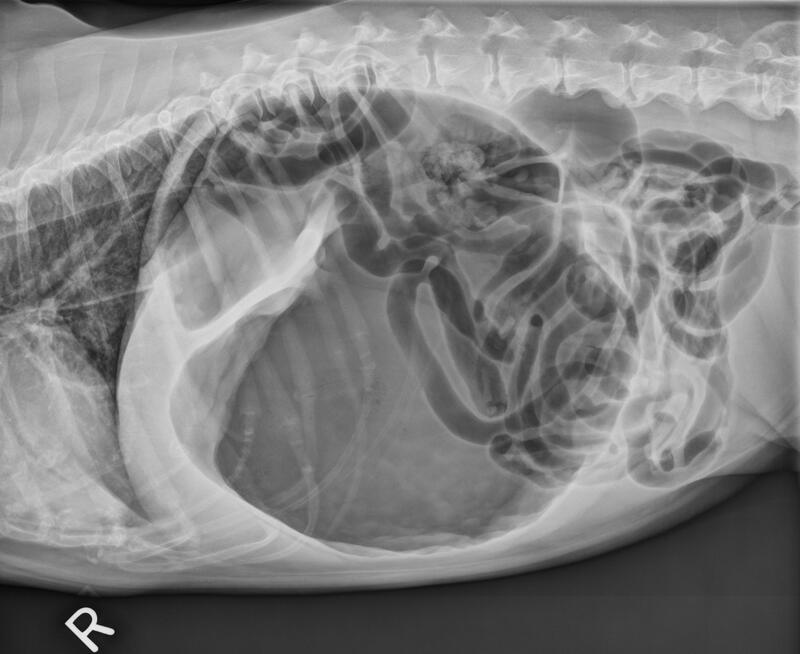 Gastric Dilatation-Volvulus (GDV) is a rapidly progressive life-threatening condition of dogs where built-up food and gas cause the stomach to dilate to a point where neither may be expelled. The increased pressure and size of the stomach may have several severe consequences, including: • prevention of adequate blood return to the heart from the abdomen • loss of blood flow to the lining of the stomach • rupture of the stomach wall • pressure on the diaphragm preventing the lungs from adequately expanding- leading to decreased ability to maintain normal breathing and tissue death from inadequate oxygenation. Additionally, the stomach can become dilated enough to rotate in the abdomen, a condition called volvulus, leading to blockage of the blood supply to the spleen and the stomach. Initial signs are often associated with abdominal pain. These can include but are not limited to: • an anxious look or looking at the abdomen • standing and stretching • drooling • distending abdomen • retching without producing anything As the disease progresses, your pet may begin to pant, have abdominal distension (bloated belly), or be weak and collapse and unable to stand/walk. 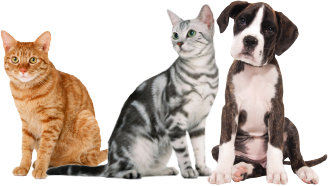 Most pets are in shock, therefore rapid stabilisation is paramount and often begins with intravenous fluids, oxygen therapy and analgesia. Abdominal x-rays are used to confirm a diagnosis. Gastric decompression often follows, which includes the passing of a tube down the oesophagus into the stomach to release the air and fluid accumulation. In some cases, a needle may be placed into the stomach from outside the body to release air and aid in the passing of the tube. The time for general anaesthesia and surgical stabilisation will be determined by the stability of your pet and at the discretion of the veterinary surgeon. Stabilisation and surgery are best when performed early on in the course of the disease. Surgery involves full exploration of the abdomen and de-rotation of the stomach. Additionally, the viability of the stomach wall, the spleen, and all other organs will be determined. Removal of part of the stomach wall (partial gastrectomy) or the spleen (splenectomy) may be necessary. Once the stomach is returned to the normal position in the abdomen, it is permanently fixed to the abdominal wall (gastropexy). The purpose of this procedure is to prevent volvulus (rotation) if subsequent gastric dilitation occurs again.